In the past, rare treasures like these can only be found in the royal family, the museum of the Imperial Palace and the five major museums. Now they are made available to esteemed collectors like you. 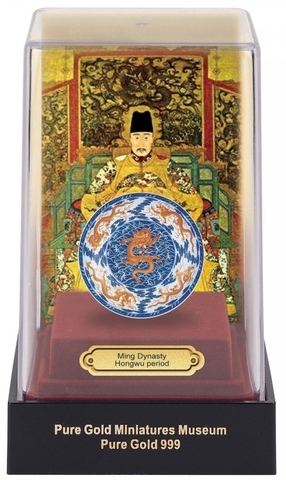 The bluish and copper-coloured porcelains had witnessed the rise and fall of emperors Yong Le, Hong Wu, Yong Zheng and Qian Long. Their brilliant blue and copper-red are full of oriental charms with flowers of the four seasons, the blossoming spring, the interplay of fruits, pine, bamboo and plums. 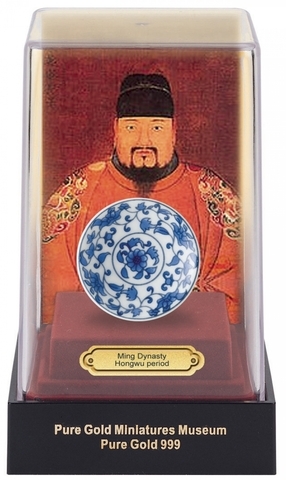 They are the favourite of the Emperors during the Ming and Qing Dynasties, as well as many collectors. These are indeed extremely beautiful pieces of art and the most important national treasure of China in the past millenium. The rarity and the everlasting lustre of gold are so alluring that rules of the ages loved to have their portraits cast in gold. Each display stand is beautifully moulded from a single piece of high quality, crystal clear acrylic. This base allows the art pieces to be displayed individually, or in a set of ten. They can be housed in a display cabinet, or in the living room. The entire set is like a mobile display window, beautifully stand. 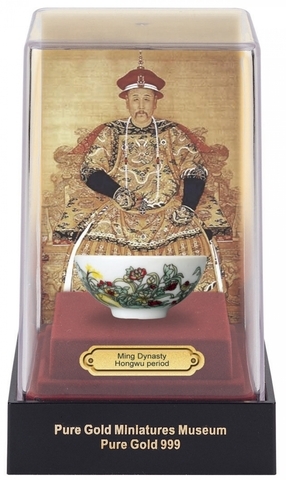 The unique color of 'Qing Hua' (green petal) porcelain is due to the use of cobalt and the high temperature glazing process. The design is first painted in China using cobalt oxide. It is then given a clear glaze, and heated to a high temperature (1280.C). 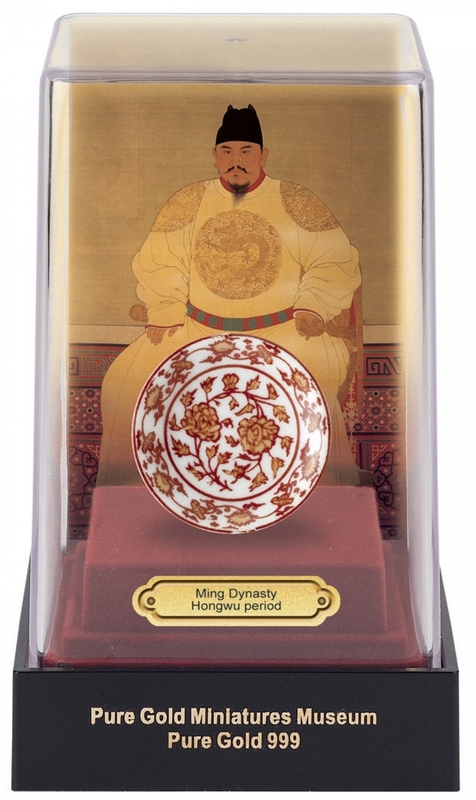 The red color of 'You Li Hong' (reddish in the glaze) porcelain comes from the copper used, and it uses the same high temperature glazing process similar to that of cobalt. The difference is that copper needs to be heated in a reductive environment to obtain its red color. As such, it is even more difficult to obtain the unique reddish colour. 1A. An underglazed red plate with peony and chrysanthemum scroll. 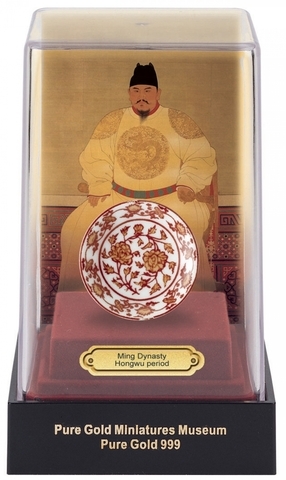 A rare underglazed red decorated basin from the Hongwu period of the Ming Dynasty. 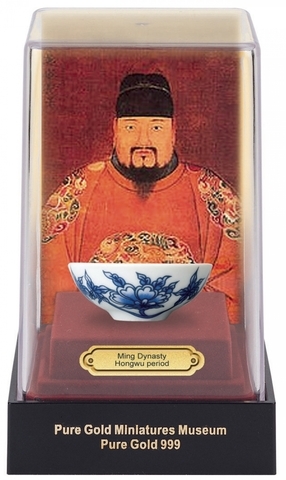 The official wares of the first Ming Emperor Hongwu (1368-98 A.D.). 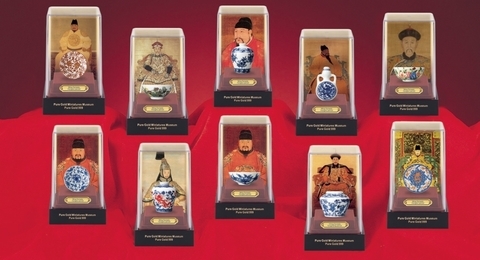 The Authentic ware has been auctioned in HK on 16 May 1989 by Sotheby's Art In Auction for HK$20.35 millions. 1B. A bowl in enamels decorated with exquisite birds, flowers and poem. The superbly enameled bowl was decorated with landscapes, bird, flower, poem designed produced in the Yongzheng's reign (1728 A.D.) period of the Qing dynasty. The Authentic ware has been auctioned in HK on 14 November, 1989 by Sotheby's Art In Auction for HK$16.50 millions. 1C. A blue and white "mei-ping" vase, decorated with fruits and flowers. 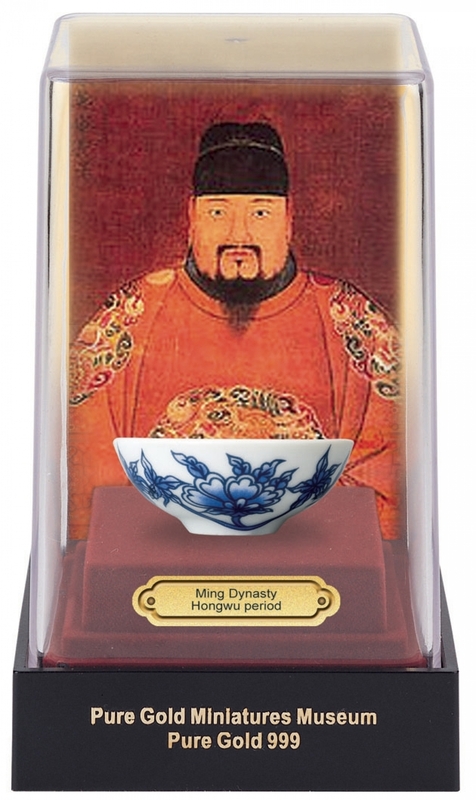 The thin glazed wares of the Yongle period of the Ming dynasty is one of the prototypes of porcelain in succeeding dynasties. The Authentic ware has been auctioned in HK on 19 November, 1986 by Sotheby's Art In Auction for HK$ 7.70 millions. 1D. 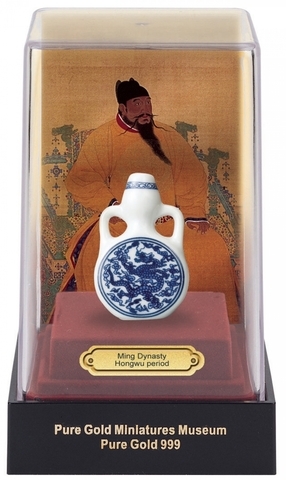 A blue and white double-handle-gourd-shape flask with cloud and dragon. The porcelain flask was decorated with cloud and dragon design and was produced in the Yongle period of Ming Dynasty. The Authentic ware has been auctioned in HK on 18 November, 1986 by Sotheby's Art In Auction for HK$ 7.15 millions. 1E. A bowl in opaque enamels decorated with exquisite flowers. The enameled bowl was decorated with different kinds of flowers and was produced in the Yongzheng's reign (1728 A.D.) period of the Qing dynasty. The Authentic ware has been auctioned in HK on 29 October, 1991 by Sotheby's Art In Auction for HK$ 6.05 millions. 1F. A blue and white plate with floral scroll. The official wares of Chenghua have a lyrical beauty. The jar with the tian character decorated with doucai is particularly charming; it is marked with tian in blue and white pigment on the base with no double band. 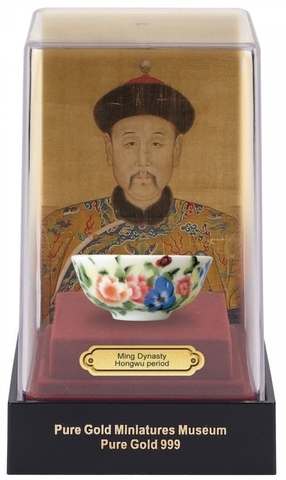 The Authentic ware has been auctioned in HK on 20 May, 1987 by Sotheby's Art In Auction for HK$ 5.50 millions. 1G. An underglazed blue and red "mei ping" vase with dragon design. 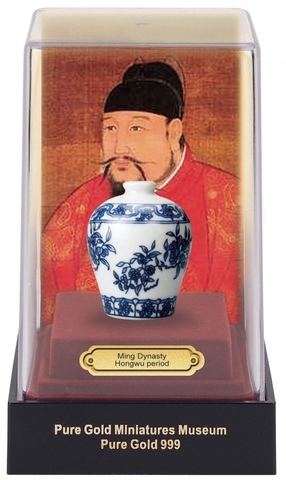 This is a replication of a fine blue and copper-red vase with patterns of dragons and peonies from the official kiln in the Yongzhen period. It features two dragons gliding among the twining sprays of peony, chrysanthemum and lotus. 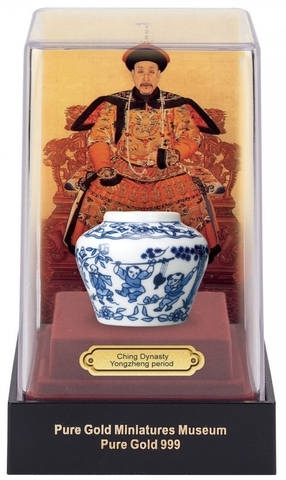 The Authentic ware has been auctioned in HK on 22 March 1993 by Christie's Art In Auction for HK$ 4.97 millions. 1H. A blue and white bowl with floral scroll. The official wares of Chenghua have a lyrical beauty. The jar with the tian character decorated with doucai is particularly charming; it is marked with sky in blue and white pigment on the base with no double band. 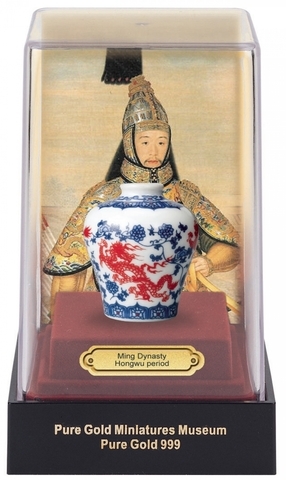 The Authentic ware has been auctioned in HK on 20 May, 1987 by Sotheby's Art In Auction for HK$ 4.07 millions. 1I. A blue & white jar with children at play. This large jar finely painted with a scene of boys in various activities, all within a terraced garden with plantains and pine trees. It was made in Jiajing period of Ming Dynasty. 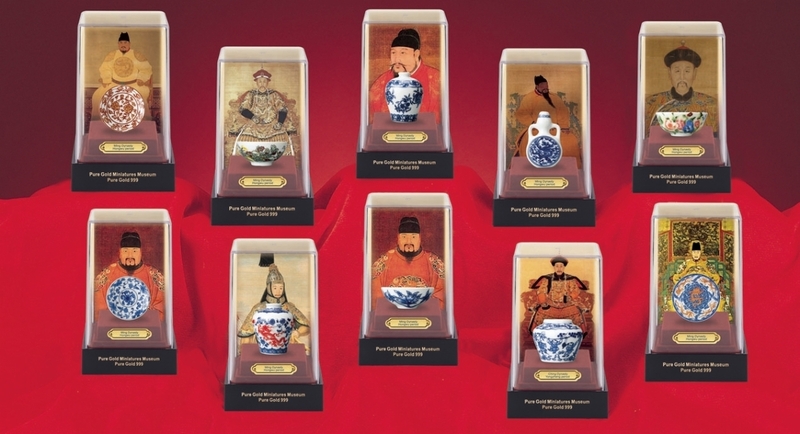 The Authentic ware has been auctioned in HK on 14 November, 1989 by Sotheby's Art in Auction for HK$ 3.52 millions. 1J. 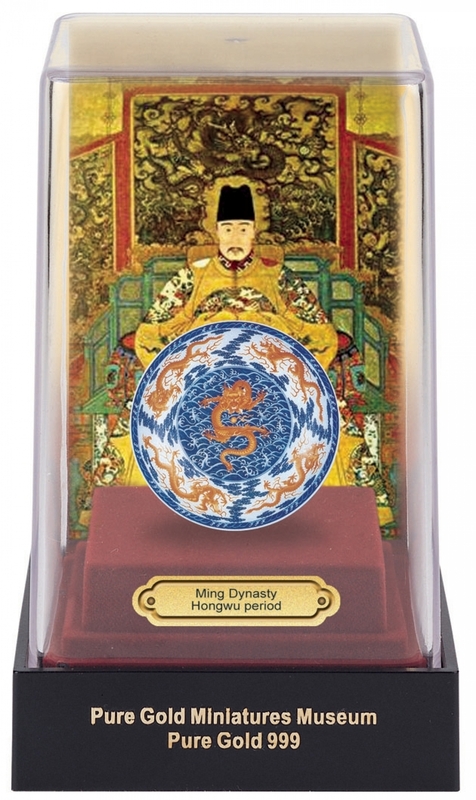 A blue and white plate with red color and dragon design. As the emblem of the Emperor and the Imperial command, the legend of the Chinese Dragon permeates the ancient Chinese civilization and shaped their culture until today. Dragon is referred to be the divine mythical creature and governs the rain, river, lakes and seas. 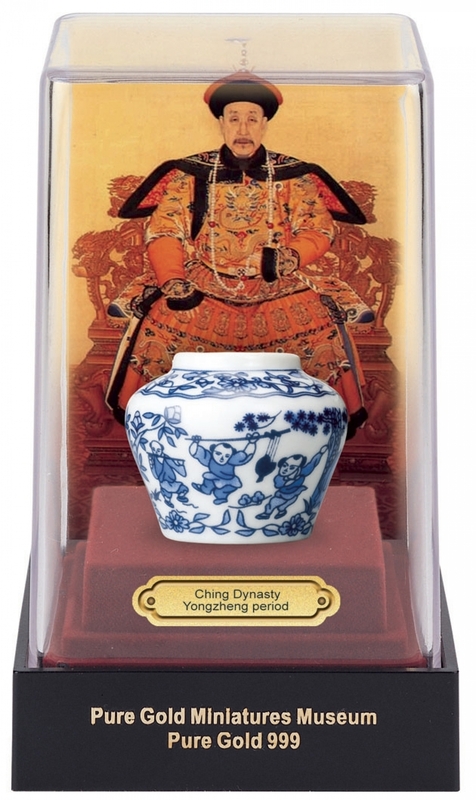 The Authentic ware has been auctioned in HK on 15 May 1990 by Sotheby's Art In Auction for HK$3.08 millions.